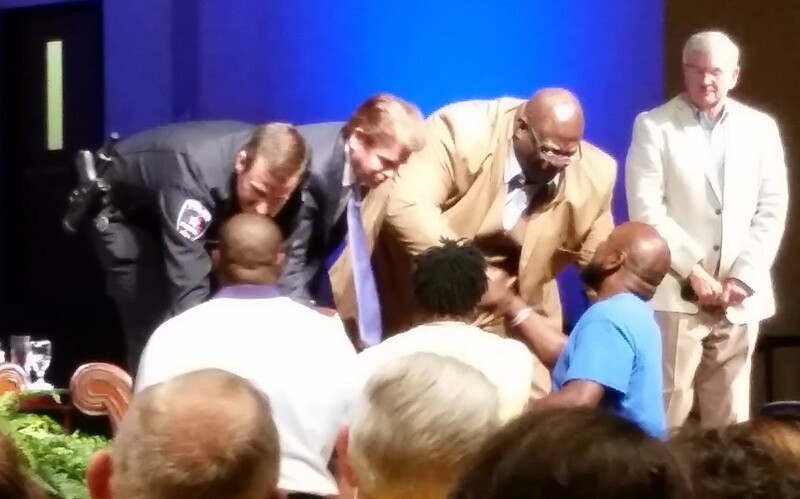 Police Chief Will Johnson, Mayor Jeff Williams and Pastor Dwight McKissic greet the family of Christian Taylor. According to the New York Times, Will Johnson’s swift decision to fire the officer responsible for shooting Christian Taylor represents the standard practice for police chiefs across America. Ever since Ferguson, Missouri was engulfed in months of controversy following the death of Michael Brown, police departments have been bending over backwards to avoid becoming “the next Ferguson”. Maybe. But, shortly after Ferguson became front page news, I was on a panel discussion with the Arlington police chief and he was talking about “procedural justice,” the idea that police departments function most effectively when they maintain a transparent dialogue with the communities they serve. In the course of the discussion I said that in troubled police departments, the problems begin at the top. Chief Johnson heartily agreed. The problem in Ferguson (and thousands of other communities across the nation) is the deep mutual mistrust between law enforcement and poor communities of color. As David Kennedy argues in his book Don’t Shoot, toxic narratives, rooted in crude stereotype and broad-brush generalization, often persist within both police culture and poor black neighborhoods. Both sides assume the worst about each other and that’s why a single tragic incident can set off a firestorm. In Ferguson, law enforcement ratcheted up the tension by attempting to intimidate protesters into submission. “Comply or die” was the implied message. This approach, naturally, fans the flames of protest. Activists respond by becoming even more confrontational, police officers respond in kind, and the situation spirals out of control. Will Johnson wants to avoid this scenario, and this week his decisive action did just that. No one knows why Christian Taylor stomped on cars at an Arlington car dealership, then drove his vehicle inside the dealership through a glass door. When several police officers arrived at the scene the goal was to containment. No one’s life was in danger, so the obvious strategy was to block all avenues of escape and give the perpetrator time to realize the hopelessness of his situation. But Brad Miller, a 49 year old officer in training, didn’t grasp the logic of that strategy. Seeing the broken glass where Christian Taylor had driven his Jeep into the dealership, Miller decided to enter the building alone with the goal. Two big mistakes. First, the officer acted without communicating with his fellow officers; secondly, he hadn’t thought things through, had no arrest strategy and wasn’t prepared for a confrontation. Instead of deescalating a dangerous situation, he was putting a confused man in the kind of comply-or-die situation that never ends well for anyone. According to his family, Christian Taylor was a good kid. An ‘A’ Student at Angelo State University. A gifted athlete. A devout Christian who prayed for his community every day. Taylor had no history of mental illness and, so far as anyone knows, wasn’t abusing drugs or abusing alcohol in the days prior to the incident. Most likely, the young man was in the grips of a psychotic break. Confronted by an armed officer, he held up a set of keys and announced that he was going to steal a car. Sane people don’t talk like that, nor do they drive their vehicles into car dealerships. In short, Christian Taylor wasn’t in his right mind and was unlikely to respond positively to verbal commands. And that is why Brad Miller had to be fired. The officer’s pastor spoke at the community prayer service sponsored by Arlington’s Cornerstone Baptist Church, and had nothing but praise for Mr. Miller. He had always wanted to be a police officer and decided that, even at 49, it wasn’t too late to realize that dream. Now, that dream is as dead as Christian Taylor and Miller must live with self-doubt and remorse for the rest of his life. Rushing into a building without communicating with your superiors is a classic rookie mistake. Miller wanted to show his stuff. He was willing to place himself in danger even though police protocol counseled otherwise. He doesn’t have the temperament for police work (many officers don’t) and he showed it in the worst possible time in the worst possible way. Chief Johnson made the right call. But, handled poorly, this case could easily have become another Ferguson. Initially, the Taylor family complained to the Manchester Guardian that police officials were giving them the silent treatment. But there turned out to be a very good reason for the initial silence: Chief Johnson wasn’t going to speak publicly until he had his facts, and his talking points, straight. Alan Bean (center) in conversation with Rev. 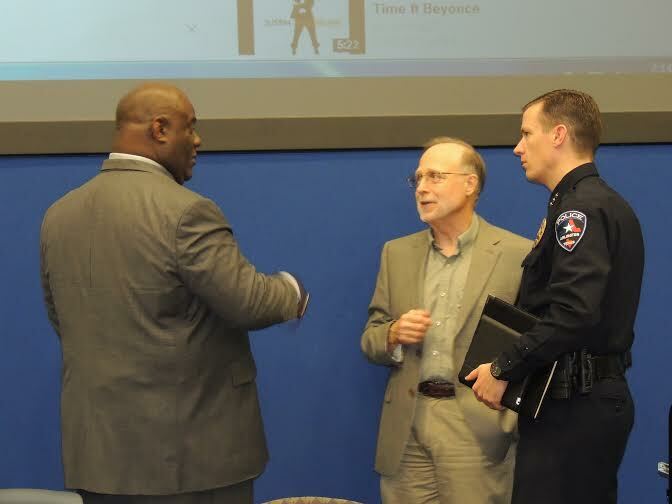 Dwight McKissic (Left) and Arlington Police Chief, Will Johnson. Pastor Dwight McKissic should be praised for pulling together a community service characterized by message discipline. No one spoke substantively until a full hour of worship had set the emotional and theological foundation for the evening. No one, in the absence of good information, tried to explain Mr. Taylor’s bizarre behavior. No one, save Chief Johnson, described the tragic events and the chief;s performance was flawless. He described how the operation should have been handled. He explained the linkage between officer Miller’s poor judgement and the end result. And then, for a full hour, he answered carefully vetted questions from the community. Dwight McKissic traveled to Ferguson last year as an observer and, having spoken with him on several occasions, I know he is deeply concerned about racial justice. But he didn’t want the frayed emotions of the moment to derail a meeting called for the purpose of unity and reconciliation. McKissic and I both attended a similar event at a Dallas church last year where several families who had lost loved ones in police shootings hurled insults and curses at public officials. The pastor of Cornerstone Baptist Church didn’t want any of that going on in his sanctuary and took effective steps to limit questions to the issue at hand. Statements were not allowed, only questions, and questioners were briefly vetted before getting a turn at the mic. Several questioners were representing their Sunday school classes, and their excellent questions, though pointed, were always respectful. When the service was over, I asked the police chief if he thought the absurd American statistics on police shootings said as much about American society as they say about police culture. In other words, is one of the reasons American cops are so much more likely to shoot civilians related, to a certain extent, to the violent and chaotic nature of American society? Johnson agreed enthusiastically with my premise, although we didn’t have time to explore the matter in depth. Having lived in both Canada (a country with strict gun controls) and the United States, I am painfully aware of the singular aspects of American culture. The free availability of fire arms is a huge problem, especially in neighborhoods characterized by poverty, unemployment, and crime. David Kennedy’s, Don’t Shoot is the best analysis of black-on-black violence I have come across. The mayhem, he believes, is driven by a tiny group of psychopathic personalities who enjoy violence for its own sake. Most gangs, and most gang members, secretly hate the violence and wish they could escape it; but the realities of street life make it difficult to lay your weapon down. It should be noted that Christian Taylor, the young man who died in Arlington, didn’t come from the violent world I have just described. In fact, he was committed to helping people trapped in violent sub-cultures, and he wasn’t armed the night he died. But police officers don’t just fear violence from gang-bangers; with each passing year, mass killings of the Sandy Hook, and Charleston variety are becoming increasingly common. Men in battle fatigues carrying semi-automatic weapons think its cool to parade through restaurants and department stores just because the law allows it. Furthermore, much of the pro Second Amendment rhetoric in the nation is rooted in the insane notion that if everyone was armed, and prepared to spray bullets at the slightest provocation, we’d all be a lot safer. Although crime rates have been plunging to record low levels, there remains a widespread belief, echoed recently by Donald Trump, that we are in the middle of an unprecedented crime wave. Violent crime on a mass scale is limited to a small number of neighborhoods in a few American cities: Chicago, New Orleans, Detroit and Baltimore, for instance. But we have become a nation characterized by fear and what theologians call the myth of redemptive violence. Our movies, our television dramas and our video games are predicated on the allure of violence. And the cumulative weight of all this madness makes it hard for police officers (and their significant others) to sleep at night. You never know when somebody’s going to pull out a piece and start firing. Police officers in countries like Britain, France, Germany, Australia and Canada have far less to worry about. America is a wonderful nation in many ways; in fact, we’re are almost as exceptional as we think we are. But we have sown the wind of violence and are reaping the whirlwind of fear. Throughout the service at Cornerstone, participants insisted that the solidarity, unity and spirit of reconciliation on display that night must constitute a beginning, not an end. But how, precisely, do we move forward? Mayor Williams, Pastor McKissic, Chief Johnson, what’s the next move? Thank you for reporting on a positive approach to a tragedy that helped avoid Ferguson type violence.